If you’ve been anticipating the arrival of the next Adventures in Odyssey release, wait no longer! Album 58, The Ties That Bind, is now available for digital download. It’s a 14-part series you won’t want to miss. With each episode building off the one before, this multi-part mini-series is very unique as it teaches kids and families God’s design for the family. Also included are two behind-the-scenes bonus features and a digital discussion guide to engage conversation about the themes presented throughout the album. 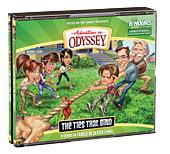 The Odyssey team has once again produced an entertaining and quality installment in the Adventures in Odyssey series. Not only that, the album delicately and effectively guides families through some of the top issues in our culture today. Who knew that a comic-book convention, a poster, and a pastoral visit could cause so much drama in Odyssey? Wooton’s got his hands full with a notorious blogger after announcing the creation of a new comic book idea—and he has to deal with a wayward cousin. Whit refuses to join in a local festival and finds himself in a citywide tug-of-war between conviction and compromise. And the unexpected return of various relatives and former adversaries triggers complications for Connie, Eugene, and the rest of their Odyssey friends. It’s the perfect blend of excitement, comedy, and important life-lessons in this special 14-episode collection! Currently, the digital download is available at the Focus on the Family Store (CBD) and via iTunes, though the album should be available on Amazon in the near future. See below for download links. Of course, if you’re waiting for the release of the CD copy of the album, stay tuned. It should be available October 2014, if not sooner. -Learn more about The Ties That Bind. –Purchase Album 58 on iTunes.